I've lived in Greensboro, North Carolina for almost 30 years and believe it to be one of the finest and prettiest places I have ever been in the U.S. Greensboro still has many of the charms of a gracious southern city and it much honors its past on a regular basis. The city's bicentennial celebration has just begun and there are countless meaningful and fun activities planned for the upcoming year. The Battle of Guilford Courthouse was a famous revolutionary battle that is celebrated through re-enactments on a routine basis. Religious tolerance dates to large settlements of Quakers and Moravians in the 1700s and the founding of the only Quaker college in the southeast when Guilford College was founded in 1837. But for all its religious tolerance, Greensboro was always a social product of its time and segregation was the law of the land for generations until 1960 when the actions of four brave African-American college students from NC Agricultural and Technical College sat down at the Woolworth's counter in downtown Greensboro and created an act of civil disobedience that literally changed the course of history. How that action changed the city of Greensboro and also set off a chain of similar actions that resulted in the repeal of the Jim Crow laws throughout the south is one of our city's finest moments. 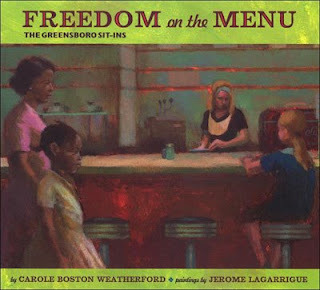 In Freedom on the Menu, Carole Boston Weatherford tells this story from the perspective of a young girl and her family who were allowed to shop at Woolworth's but never allowed service at the lunch counter. Jerome Laggarigue's dark, impressionistic paintings are both emotionally evocative and suggest the time capsule nature of those historic days. The author has posted a lesson plan on her website for grades 3-5 that will help educators and students explore the history of the Jim Crow laws and the social calls to action of leaders like Dr. Martin Luther King that emboldened those four young men to sit at the lunch counter and ask for a seat at the table of social justice. I think this book is wonderful, but I never knew about the lesson plans. Thanks for sharing. Thanks for visiting. 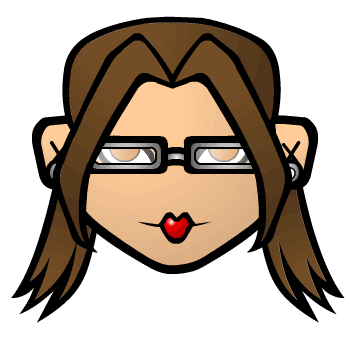 I hope to review some of the author's other titles in upcoming posts. Stay tuned.